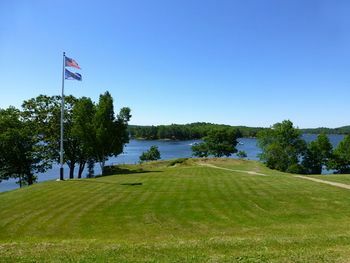 Fort Edgecomb (1808-1816) - Established as a Second System fort in 1808 at the direction of Secretary of War Henry Dearborne to protect the harbor at Wiscasset. Garrison and cannons removed in 1816 after the end of the War of 1812. Briefly garrisoned again during the U.S. Civil War. Fort Edgecomb stands as one of the four forts built on, what was at the time, the coast of Lincoln County. During the period from the American Revolution to 1807, the town of Wiscasset bustled as one of New England's busiest shipping centers. An abrupt change in the town's fortunes resulted from England's resistance to Napoleon's aggression in Europe. England blockaded France's ports and declared intentions to seize American ships that attempted to land cargo in France. The United States Congress, in turn, passed the Embargo Act of 1807, forbidding American vessels from leaving port. American ports were then closed to all nations, denying American goods to both England and France. 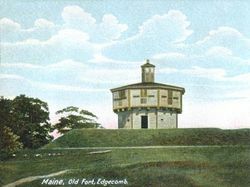 Fearing English hostilities as a result of the embargo, Congress authorized the construction of a fortification to protect the Maine coast and its vital shipping interests. Army engineer Major Moses Porter located a suitable site for a military works on Davis Island, and a week later the land, comprising 3.15 acres, was purchased from local resident Moses Davis. Construction began and by March 4, 1809, cannons were mounted and fired to mark the occasion of President James Madison's inauguration. War was declared on June 18, 1812, and soldiers hoisted the colors and fired the guns at Fort Edgecomb signaling readiness. Significant action did not begin until 1814 after the English broke Napoleon's power and diverted their war forces to this side of the Atlantic. Throughout that summer, the Bulwark, an English “ship of the line” and its flotilla of lesser vessels harried the coast of New England. 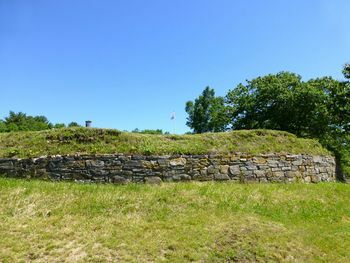 The attacking enemy flotilla showered the Fort in a hail of ignited cannon fire, sounding alarms throughout Wiscasset. Volunteer militia units quickly organized to assist Fort Edgecomb's garrison. Fort McDonough was hastily constructed and its guns were designed to work in concert with those at Fort Edgecomb with the unifying goal of preventing English ships from entering the harbor. By late autumn 1814, the great anxiety subsided. News came of peace with Great Britain on February 14, 1815, which spurred rejoicing as troops fired the Fort's cannons. The garrison remained in barracks at Fort Edgecomb until August 1816, when orders came for their transfer, and the cannons were removed to Fort Independence in Boston Harbor. No alarms sounded at the fort until the summer of 1864 when the Confederate cruiser Tallahassee sparked new fears. Although it did not see action, the Fort was garrisoned and equipped for defense. A State Historic Site open for self-touring. The blockhouse was not open at the time of our visit. No period guns or carriages in place. 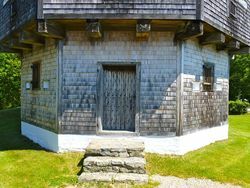 Location: 66 Fort Road, Edgecomb, Lincoln County, Maine. This page was last modified 10:05, 17 March 2019 by Bill Thayer. Based on work by John Stanton and Josh Smith.